In the days of yore when the Jade Emperor ruled the heavens, Vietnam was struggling to form a nation and survive amongst powerful, hostile neighbors. The Chinese Empire was expanding, and Vietnam seemed an easy target. Their fleet of war junks attacked from the sea and threatened to overwhelm the small Vietnamese navy. In answer to the Vietnamese prayers, the Jade Emperor sent the mother dragon with her children to their aid. The dragons flew over the bay and destroyed the massive Chinese junks with fire and fury. To stop the ones that escaped, the dragons spat out jade and emeralds that fell into the sea and transformed into large islands that blocked every passage to the shore. Defeated, the Chinese withdrew, leaving the bay dotted with limestone islands, green with forest cover! So goes a favorite legend in Vietnam. One wonders if the story of Daenerys Targaryen, the "Mother of Dragons" in the Game of Thrones was inspired by this Vietnamese legend! The geological process that formed these islands is more prosaic but no less fascinating. Over millions of years, the shells of dead sea creatures sank to the bottom of the sea and formed limestone layers. Tectonic activity gradually lifted the sea bottom even higher than the adjoining land. The sea advanced and retreated again and again over several million years to eat away the softer limestone around harder cores, forming hills. Finally, the seas partially retreated to the level we see today, leaving behind tall limestone islands along the bay, over 1900 of them! 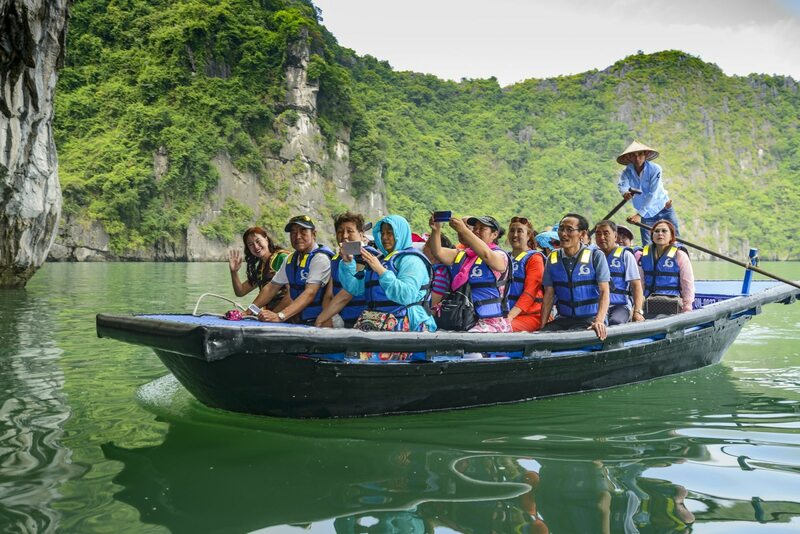 Latter-day Vietnamese seeing the bay studded with verdant islands, immortalized the dragon tale, calling the bay "Ha Long" which means Descending Dragon in their language. You can choose any origin of the bay that takes your fancy. One thing that you will agree though is that the bay, with its islands, caves, and grottos is one of the most scenic spots on earth. This fact was recognized by the world when the bay was declared a world heritage site in 1994. The bay is dotted with scores of shallow diesel powered cruise boats, some disguised as Chinese Junks with carved dragon heads and fake sails. There are many classes of cruises of varying duration from a day cruise to one that takes three days including a day on a large island where tourists can sunbathe, snorkel or scuba dive. Common to all cruises are trips to the caves and grottos of some of the 1900 plus islands in the bay. To reach the islands, tourists must first transfer to a smaller craft that takes them to a jetty. The caves are explored on foot unless they are partly under water level. Then, bamboo boats steered by a single oarsman, are used. For the adventurous, an option is to take a single or two-person kayak to explore the caves or the surrounding calm waters of the bay. The cruise boats are moored at night. Food on board is usually local, but varied and well cooked. Alcoholic drinks are available, usually at extra cost and there are other diversions such as Tai Chi lessons, squid fishing, and spring roll making. The same process of attrition that formed the towering islands also created caves in some of them. Some are closed caverns while others go right through and form openings to enclosed pools of sea water. Over thousands of years, limestone dissolved in the rainwater dripped down in the caves forming fantastic shapes of Stalactites and Stalagmites. A visitor walking in may feel as if pages of a geology textbook has come alive in three dimensions and brilliant color! 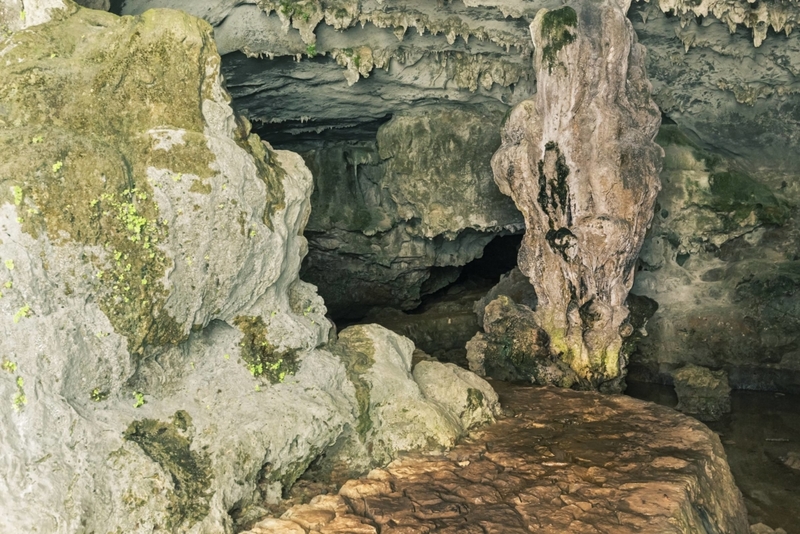 Of the many caves, a very popular one is the Ho Dong Tien cave, also known as the Fairy Lake Cave. Another one is the Sung Sot or Surprise cave. Here a tunnel takes tourists in boats from the first cave out into a beautiful enclosed water body surrounded by tall cliffs, open to the sky. The fig trees around the periphery attract monkeys. Some will come down to the water's edge to pick up food thrown by tourists. Like the Ha Long bay legend, many of the caves have legends and stories of their own. For example, it is believed that fairies descend at night to bathe, screened from human gaze in the Ho Dong Tien cave. 1,300 meters long, the Hanh Cave is the longest in Ha Long Bay. The cave can be visited only at low tide in a boat. You must carry flashlights and remember to get out of the cave before the tide rises. It is said that three beautiful virgins got trapped and lost their lives. To placate their restless souls, locals built the Tam Co (three girls temple) inside the cave. The story of the Dau Go cave is warlike. 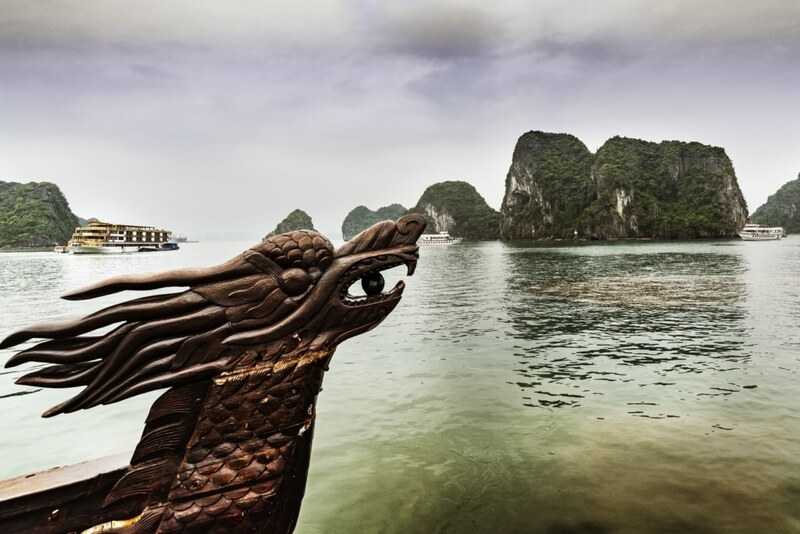 To defend the bay from Mongols, Vietnamese General Trang Hung Dao planted ironwood stakes just underwater to impede the advancing Mongol ships. The Dau Go cave was used to store the stakes, and some stakes were found floating near the cave, giving it its name, Dau Go or driftwood. 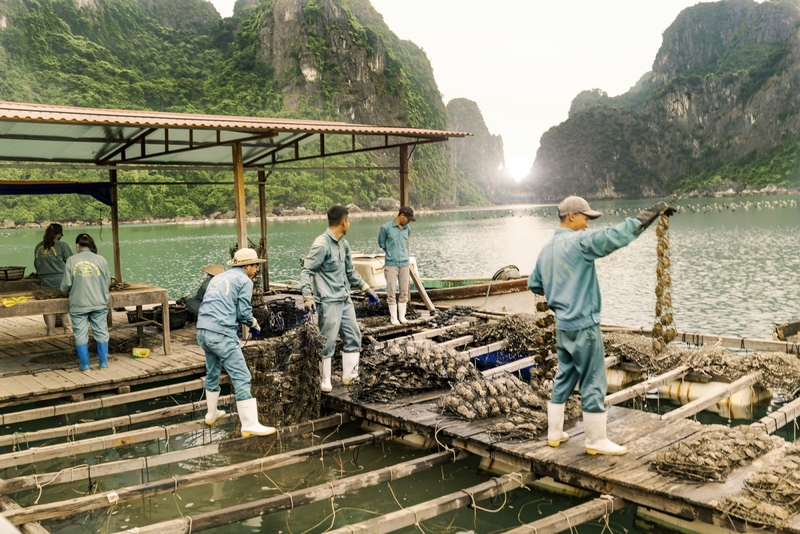 Floating oyster farms are a special feature of Ha Long Bay where the temperature, salinity, and stillness of the sea water is just right for rearing pearl-bearing oysters. Begun by the Japanese, there are two farms open to tourists, both now owned by Vietnamese companies. Approaching in a smaller boat from a cruise ship, tourists land on a wooden jetty floating on a bed of air tanks. Oyster pens stretch out on both sides of a gangway. Oysters are gathered from the seabed, fixed in frames covered by netting and allowed to grow in their pens. Coaxing the oysters to grow pearls is a delicate operation. The oysters are retrieved from time to time to observe their growth and to weed out dead ones. When matured, they are removed to an inspection station and selected for their suitability. The selected ones are opened by skilled technicians in sterile conditions, and a small shell bead is surgically implanted inside along with a tiny piece of oyster mantle tissue. The irritation caused by the shell bead causes the oyster to secrete layer after layer of nacre, the substance that forms pearls. As the oyster grows, its mantle uses minerals from its food to grow nacre. A seawater oyster will take as long as 5 to 20 years to be coaxed to grow Gemstone quality pearls! 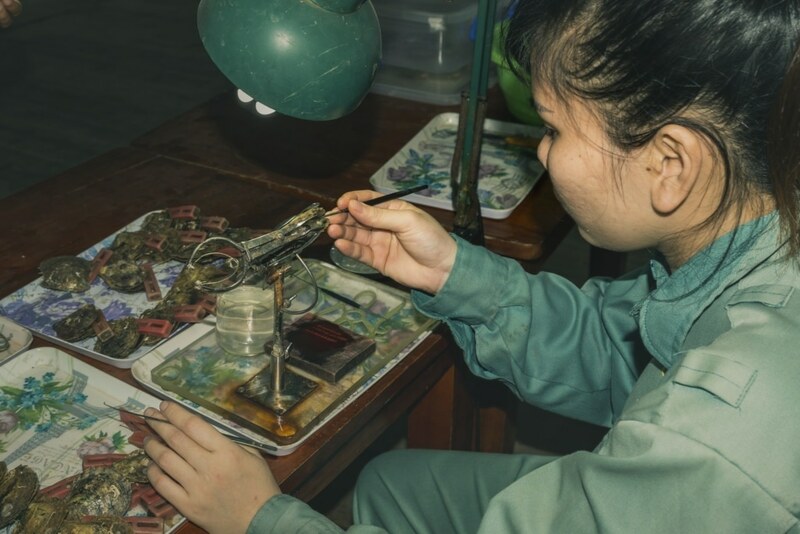 The harvested pearls are converted into jewelry or sold as loose pearls at the rear of the floating oyster farm where visitors can also witness the seeding operation. Fortunately, harvesting a pearl does not kill the oyster, and pearl farming is a humane and sustainable practice. Dear Jayant, my husband Chander and I were on holiday in Halong Bay exactly one year ago to the day. Your article brings back wonderful memories of the two-day boat cruise. Enriching the memories are the gems of information and interesting local legends that you have described. Thank you for ferreting them out and sharing. Looking forward to your next travel story. What gorgeous islands Jayant – emerald havens! And the Dragon’s Tale was fascinating! Many thanks. Please keep encouraging me! My next one on Cambodia will be published on Feb 15! Thank you for your lovely and encouraging comments.